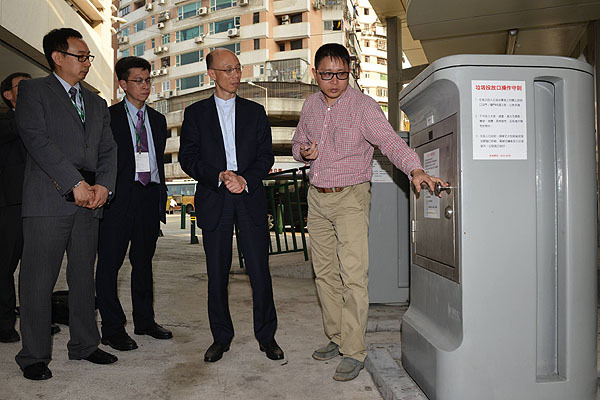 Out of sight: Secretary for the Environment KS Wong inspects the waste automatic collection system in Areia Preta. Secretary for the Environment KS Wong today led a delegation to open the 2014 Macau International Environmental Co-operation Forum & Exhibition. He toured the exhibition booths to see business opportunities brought by modern environmental technologies and green solutions for a sustainable city. He met Macau’s Secretary for Transport & Public Works Lau Si-lo, Director of the Office for the Development of the Energy Sector Arnaldo Santos and other Macau officials. He also met the Portugal's Secretary of State of the Environment Paulo Lemos and his delegation. Mr Wong inspected the waste automatic collection system in Areia Preta. Comprised of waste collection points, underground pipelines and garbage inlets, the system can collect 35 to 40 tonnes of garbage daily and serves about 15,800 households. He and the delegation will return to Hong Kong after a dinner the Macau Government is hosting.